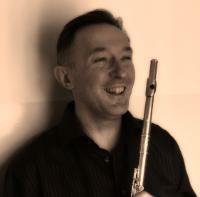 Ciarán O’Connell is a lecturer in flute performance at DIT Conservatory of Music and Drama where he has taught since 1988. His early flute studies were with William Dowdall at the innovative wind band programme at CBS Westland Row. He later participated in masterclasses and had private lessons with Geoffrey Gilbert. Ciarán has performed with the NSO, RTÉ Concert Orchestra, ICO, and has played for many theatre and opera productions. Recent performances include the Kilkenny Arts Festival, St. Stephens Church, the Pepper Canister and at the St Patricks’s Festival, Sigoyer, France. He is in demand as a flute specialist and has tutored the flute sections of the JNYO, DYO, IYWE and is regularly invited to adjudicate, examine and give masterclasses at music festivals and schools. An enthusiastic and dedicated teacher his students range from beginners to masters level, many of whom have been prizewinners at local and national level, while some have successful careers in the music business. A keen chamber musician Ciarán has a special interest in the repertoire for wind quintet; flute and guitar, and more recently flute and organ. Our Mission is provide musicians with the opportunity to rehearse and perform professional standard Film Scores as part of a full Concert Orchestra. Our Courses are designed to provide access to the very best of film scores from composers such as John Williams, Michael Giacchino, Alan Silvestri to name just a few! Past members of our course include musicians that have travelled from countries from across Europe. Read all about our upcoming concerts and courses and get in contact with us if you would love to apply/audition!